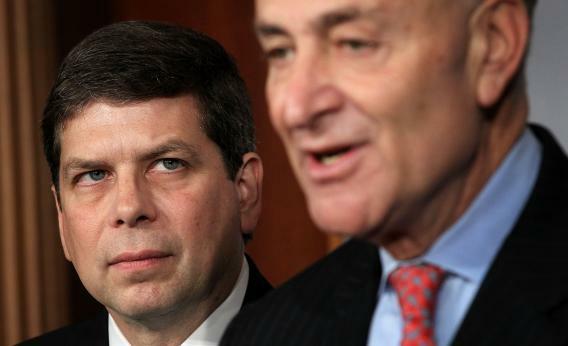 U.S. Sen. Charles Schumer (D-NY) (R) speaks as Sen. Mark Begich (D-AK) listens during a news conference December 5, 2012 on Capitol Hill in Washington, DC. Alaska is notoriously difficult to poll, but this Harper Polling survey both 1) comes from a Republican outfit and 2) has a large sample size: 1,127 voters. And it has one of 2008’s most accidental victors holding his own. [Democratic Sen. Mark] Begich leads Alaska Lt. Gov. Mead Treadwell (R) by 44 to 34 percent, and holds a gaping 52 to 29 percent lead against 2010 Senate nominee Joe Miller (R), two Republicans who’ve indicated interest in the race. He also leads former Alaska Gov. Sarah Palin (R) by 47 to 40 percent. Miller, the great-on-paper conservative who took the 2010 GOP nomination, is one of the very few candidates who can say he lost to a write-in. Scott Conroy’s done an admirable job explaining just how screwed the party would be if Miller ran and won again. But Treadwell is already running, on the theory that a guy with an R after his name, in a Democratic president’s midterm year, with a popular Republican governor atop the ballot, should be able to knock off Begich. It’s possible! Begich and North Carolina Sen. Kay Hagan are the red-state Dems to watch this year, as both of them won in unique conditions (Begich was running against an indicted Ted Stevens, Hagan had Obama turning out black voters), and both have evaded the anger of rural white voters because Democrats never moved on gun control. Until recently, when Democrats started moving on gun control.